The tree of life is a symbol found in many of the world’s cultures. It represents how our world is wholly interconnected – the leaves and the roots, the large and the small. 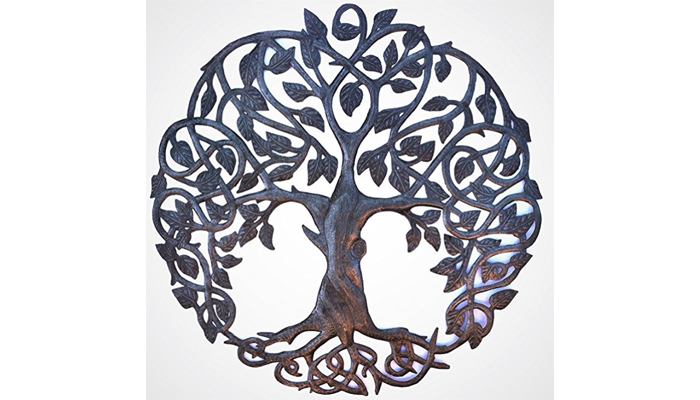 This metal wall hanging depicting the tree of life is a fair trade creation from Haiti. Amazingly, these trees are created from recycled steel drum oil barrels. It’s pretty phenomenal to think that something so simple can then create this beautiful work of art. Haiti is one of the most impoverished places around, and the residents there often have few opportunities to better themselves. By supporting fair trade artists, you allow the residents of Haiti to support themselves and their family members. I have several metal art items from Haiti in my own home. Every time I look at them I’m reminded to be grateful for all that I have, and that I live in a place which has afforded me opportunities not found in many other places. The tree is 23 x 23 x 1 inches.